In a big pot, heat some oil, brown the chopped garlic and onion, add the blended tomato, carrot, basil and oregano. Simmer for 25 minutes with the lid set slightly ajar. Taste and season. Discard the onion, carrot and the herbs. In a saucepan, heat 2 tablespoon oil, fry the minced over very low heat. Once you smell the fragrance, pour the garlic oil into the sauce. Simmer for another 5 minutes. The basic tomato sauce freezes well. My compliments for the oregano. I didn't know it can grow this way. And I didn't know as well the Italian tomatoes were naturally sweet. Lots of tips for an aromatic sauce. Thank you for posting it. 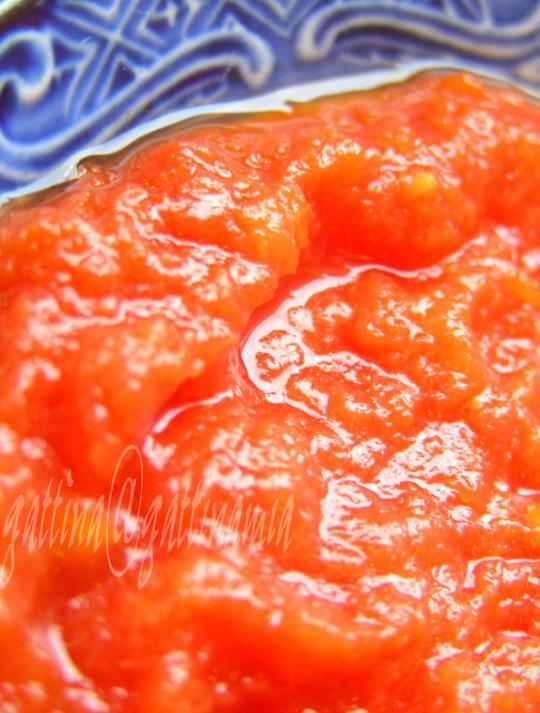 Lovely photos as always!Does this sauce have a long shelf life? Gattina, sorry to mislead u. I dont own a blog... Too lazy to start one. Good job you have done here! Lovely tomato sauce! 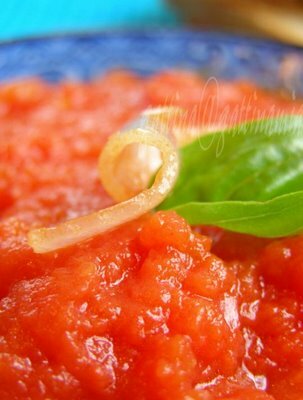 Tomato sauce recipe is interesting. Hope you threw tomatoes seeds in your yard.there's a chance to find tomato plants growing in your yard as well. Thank you for sharing a special recipe and information about Italian plump tomatoes. You always show that fine food photography doesn't require much props. Good !!! Yummy. One of my favorite things to make from tomatoes. I agree, there is a big difference in the flavor of different varieties. Hi Virginie, you may have other wonderful tomatos in your country that is great for sauce, since I'm living in the States, so can only compare with the local tomatos. Hi sumitha shibu, for me if I know the sauce isn't going to finish in a day or two, I freeze them. It freezes well for a month... not sure a longer period as I use it up very quick. ramya, it's a good idea, may try when I have more time. Thank you! Archanat, I wish I had an ability to take a staged photo (table setting with some props)... maybe some days (or months or years...) when I have extra money. Again, thanks for your encoragement! Edith, thanks for your kind words. I wish I had a great cake making skill like you too! Kalyn, I;m waiting to see you harvesting your beautiful tomatos! !Hola! Soy de Hongkong y vivo en Barcelona, Espana. Hace algunos años, cuando vivía en America, me inspiraron los panaderos artesanales en mi barrio y la TV programa "Baking with Julia", comienzco a hacer pan por mano. También me fascinan el "gadget" manual, el alimento orgánico y la vida ecológicoa -------------------Hi, I am from Hongkong, now live in Barcelona. A few years ago when I lived in the States, I was inspired by the artisanal bakers in my town, and a TV show called "Baking with Julia", that's how I start making my bread, pasta and pastry by hand. I also love organic food, eco-friendly living and happy animal. MANGO & other fruits in meringue "bastket"
HAM, cheese & leek "pinewheel"
ALMOND rice & mango "sushi"